We’re now well into the second half of 2018 and a question has nagged at me all year: do we really need tablets anymore? Phone displays are getting bigger and bigger and we now routinely see phone displays that span more than 6-inches. That’s pretty crazy considering just a few short years ago we reveled at a 4.5-inch display, even wondering if it was too big. So, as the devices in our pockets get bigger, faster, and stronger, why do we need tablets? Aren’t phones good enough now to take care of all of our needs? To answer this question, I reached out to Huawei, asking to take a look at the MediaPad M5 Pro. The 10.8-inch tablet is widely viewed as one of the best on the market today. If there’s anything that can make the case for tablets as a whole, this is the one to do it. Just a note before we go on. There are three versions of the MediaPad M5 available today. An 8.4-inch MediaPad M5, a 10.8-inch MediaPad M5, and a 10.8-inch MediaPad M5 Pro. The 8.4-inch and 10.8-inch devices are available today for $320 and $360 respectively. The 10.8 Pro is $450. 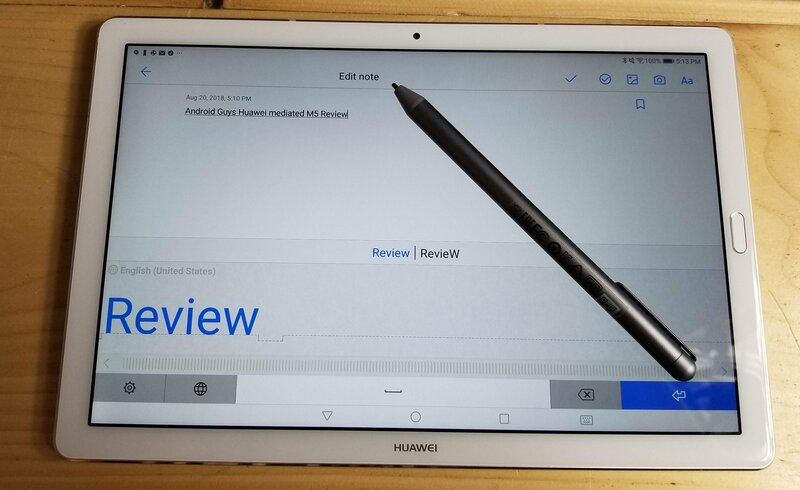 The biggest difference between the 10.8-inch models is that the Pro comes with support for the M-Pen (Huawei’s stylus), where the non-Pro model does not. Both models can connect to a keyboard dock via Pogo pins on the rear of the device, but one was not available for this review. For purposes of this review, we are reviewing the 10.8 Pro version with M-Pen included. The MediaPad M5 Pro is a good looking device, but further inspection leaves us feeling… unimpressed. Sure, it looks just fine. It’s classy and non-offensive but there’s nothing to write home about here. You won’t find yourself feeling awkward about pulling it out during the bus ride to work or on the plane after take off. You will feel just fine about taking notes on it during a business meeting or relaxing with it on the couch. But, there’s just no wow there. It feels very plain to look at. The metal back offers almost no design flair at all besides Huawei and Harmon Kardon logos. The top houses a rather large camera bump and the Pogo pins at the bottom are flanked by two large speaker grills– two more line the top too. Yep, that’s four speakers (we’ll touch on them later). Read More: Honor View10 Review: The budget flagship king? The right side of the device finds the volume rocker and power button. These are wonderfully clicky buttons and Huawei did a good job of placement here. Most people hold larger tablets in landscape and they’re placed perfectly for that. 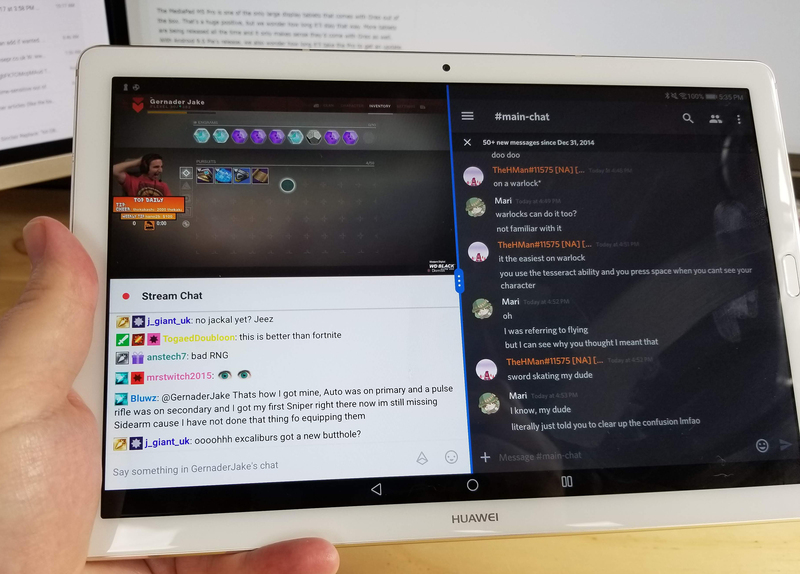 If you hold your tablet vertically, they’re a little awkward but we found no real issue. No matter where you place the buttons, there’s always going to be someone with an issue. We’re just happy with how high quality they are. Just below the buttons are a microSD card tray and a USB type-C port. Some of our friends who we let play with the tablet remarked that this was an odd place for the charging port, but once we pointed out that the tablet supports keyboards that attach to the Pogo pins, they understood the placement. 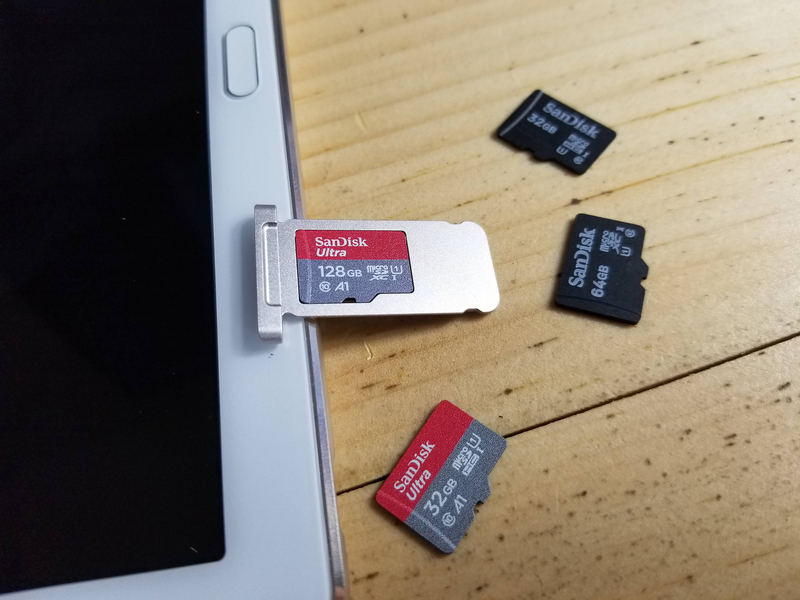 Unfortunately, the microSD card tray is just a single card slot. We’d have loved to see 4G LTE support on these tablets, but those have been reserved for markets across the ocean. 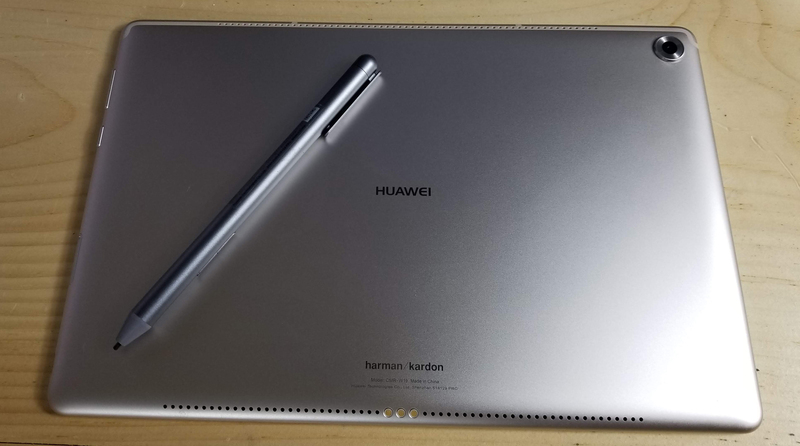 Huawei seemingly targeted this specific tablet at those who want to get a little work done and we think cellular connectivity could’ve gone a long way for that set of folks. The front sees a similarly barren layout. The right side of the device houses a fantastic fingerprint reader and the bottom presents a Huawei logo shining back at us. That’s about it. Our Champagne Gold and White version looks just fine, but we found the darker colors of other models to be a bit more appealing. Back to that fingerprint scanner– we’re in love. Not only is this thing fast, accurate, and in a great spot, but it supports fingerprint gestures too. We routinely used it as our home button, but you can also head into the settings to set up back and multitasking gestures too. We did run into some accidental home button presses here, but nothing we were overly annoyed at. The display is big, bright, and beautiful. It’s an IPS LCD display that has a 2560 x 1600 resolution. For those of you keeping score at home, that’s a 16:10 aspect ratio. We love aspect ratio as most widescreen media clocks in at a 16:9 aspect ratio. Media looks absolutely fantastic here. While colors and blacks don’t look quite as good as on AMOLED displays, we were pleased nonetheless. Max brightness was more than enough to provide a clear picture on sunny days and we found colors to be pleasingly warm. This isn’t the most accurate display in the world, but it does look damn good. Flanking the display are decently sized bezels. As we watch bezels grow smaller and smaller on our phones, we’re glad Huawei stuck with this chunky monkey. The bezels are small enough to look nice while providing enough grip. This is always going to be a two-handed device (and the slippery back provides no help in that area), but we always were able to comfortably reach our thumbs to the middle of the tablet to type and press buttons while playing games. Huawei pulled off a solid, if not uninspiring, feat here. The device, on first inspect, feels a bit bland and forgettable, but after spending time with it, it becomes clear that the MediaPad M5 Pro is more than the sum of its parts. If you’re going to charge as much as some cheaper laptops for your tablet, performance has to be top notch. We’re happy to report that we have no issues here and were quite surprised in some instances. The MediaPad M5 Pro has a HiSilicon Kirin 960 CPU, 4 GB of RAM, and 64 GB of space. Huawei made the decision to release its flagship tablet without its flagship processor inside. It’s a puzzling decision on paper. But, once you use the MediaPad M5 for a while, you see why. We’re under the assumption that it costs less for Huawei to pump out the Kirin 960 chips today and there’s almost no loss in performance. During our time with the tablet, we saw no hiccups. This thing is blazingly fast in most tasks and we found even in larger games, we were more than happy with the performance. Sure, loading times could have been better in some places, but this isn’t a $1,000 flagship phone. It costs less than half that, although you might not know it. It feels like 4 GB of RAM is now the lowest Android OEMs can get away in flagship devices– both phones and tablets. We didn’t have any problems necessarily with the MediaPad M5 knocking recent apps out of memory, but we know things could’ve been better here with more RAM. We hope Huawei will consider upping the ante in the next refresh of these devices if it wants to continue to convince people to drop their laptop for this little powerhouse. One area where we had zero issues is battery life. The MediaPad M5 Pro has a 7,500 mAh battery that supports quick charging. We got between eight and nine hours of screen on time with the tablet and took us about four hours to fill it back up in our completely unscientific tests. In phone reviews, we normally consider four to five hours the standard. Anything less and we’ll point out poor battery life. Anything more and you get some praise. Tablets are a little bit different. We’re not using our tablets as much in a given day or for the same tasks. For this reason, we found ourselves going four to five days between charges on the MediaPad M5 Pro. This is fantastic. Again, Huawei has obviously targetted a segment of the population that wants to get some work done without investing in an ultrabook or lugging around a cheaper laptop. Even if you were to work a full day while on battery power, we think you’d have no problems getting that last email to your boss in at the end of the day. We’re very impressed. The MediaPad M5 Pro comes with Android 8.0 Oreo out of the box. It has Huawei’s own EMUI 8.0 on top. If you don’t have any experience with Huawei’s skin, just know that it’s pretty heavy. Huawei obviously has its own vision of how Android should look and they go to great lengths to achieve that goal. There is literally no part of the operating system that is untouched. Whether that is a positive or a negative is up to you. Huawei has worked to add small but noticeable upgrades to the Android OS. It gives you much more control over how your display looks and acts, strict background and permission controls, strong controls for how apps are able to bug you, and many more. Where Huawei can fall down a little bit is not playing to the strengths of having a large screen. 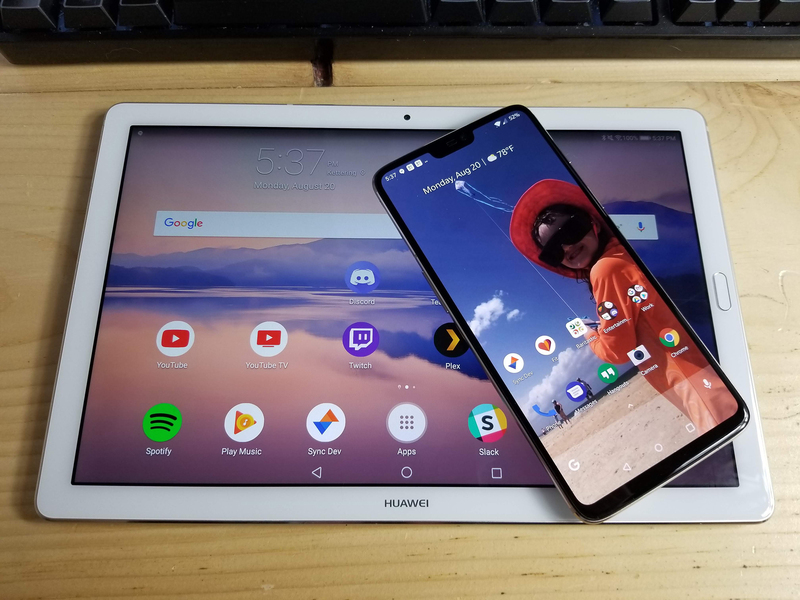 Besides some menus that have dual pane menus and allowing two apps to be run side-by-side, Huawei hasn’t done a lot here to maximize its potential. There’s a beautiful 10.8-inch display here, but sometimes it feels like I’m just using a big phone. One of the ways that Huawei has tried to reach that potential is with the included M-Pen. The active stylus is a very nice addition and the software allows you to write as you normally would with a pen or pencil. I found that Huawei was almost always able to make out what my sloppy handwriting was trying to convey. While this isn’t a more efficient way of dictation than a computer keyboard, it is far better than trying to type on a screen or on a cramped tablet keyboard (just a reminder: we don’t have the Pro’s keyboard so we can’t comment on that specific keyboard’s typing comfort). As of the writing of this review, our review unit hasn’t received an update in quite a while. We’re still resting on the May security patch. And hey, we didn’t assume that we’d get monthly updates, only Google and Essential do so, but we wouldn’t mind seeing more than three or four a year. The MediaPad M5 Pro is one of the only large display tablets that comes with Oreo out of the box. That’s a huge positive, but we wonder how long it’ll stay that way. More tablets are being released all the time and it only makes sense they’d come with Oreo as well. With Android 9.0 Pie’s release, we also wonder how long it’ll take the Pro to get an update. So, what did we learn? Do you need a tablet in 2018? Do they really make sense anymore? For me, I think they do continue to make sense. Outside of all of the productivity advantages of the MediaPad M5, this thing is just fun to use. It has four speakers, that even though they shoot the wrong way, are fantastic. I’d take these Harmon Kardon-tuned speakers on most laptops any day of the week. It also had a display that matches or exceeds the quality of what you can find on laptops at a similar price. 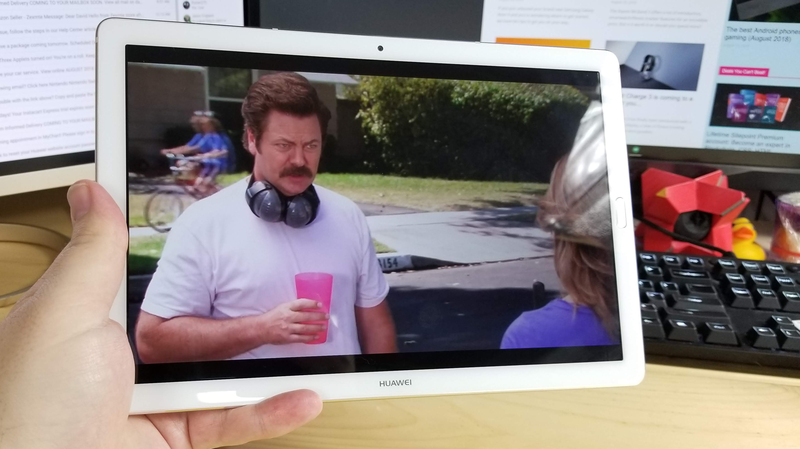 If you want a bigger screen to watch YouTube, Netflix, or Hulu on, I’d highly suggest the MediaPad M5 Pro. I also see quite a few benefits of using the MediaPad M5 Pro instead of a laptop for productivity. Yes, you are going to deal with a smaller screen and therefore a smaller keyboard. But, the MediaPad is also only 1.1 lbs and small enough to fit in almost any bag or purse. It’s highly portable, very powerful due to all of the productivity apps in the Play Store, and supports both a first party keyboard and stylus. That’s pretty powerful. My only big fault with here is that I feel like Huawei didn’t do enough to make use of the big display. Apple had been plagued by this for years with its iPad Pro lineup. It recently introduced more features to make that big display even more powerful. Huawei could do more too. We do know that when connecting it to its first-party keyboard, the tablet gives users an option to enter a desktop mode that allows free-floating windows and reminds us a lot of a Windows 10 desktop. Since we weren’t able to use this feature, we can’t comment on it too much besides giving Huawei praise for including it. Some users reported that not all apps are available in this desktop mode (the Play Store being among them) so we’d like to see this ironed out before calling the MediaPad M5 Pro a full ultrabook or Chromebook replacement.